China’s economy got off to a strong start in the first quarter, with GDP growing at 6.9 percent year-on-year, according to data released by the National Bureau of Statistics on April 17. Improvements in industrial production, investment and exports have combined to bolster the economy in that period, the bureau said. GDP growth in the first three months remained steady at 0.2 percentage point higher than a year ago, showing a stabilizing trend in the economy, analysts said. Although consumption growth dropped slightly, increasing at 10 percent in the first three months, down by 0.4 percentage point compared with the whole of 2016, an uptick in infrastructure investment and a higher export growth have contributed to the stable growth. Fixed-asset investment expanded at 9.2 percent year-on-year in the January-March period while export growth was 14.8 percent. Improvement in industrial production is also a major contributor to the stable growth in the first quarter, according to the NBS. The slight drop in consumption growth is attributable to falling vehicles sales as a result of the phase-out of preferential policies and the high base in the same period last year, according to research by the Bank of China Institute of International Finance. Data in March showed that the economy remains resilient, Xie Yaxuan, analyst of the China Merchants Securities, said. He cited the Purchasing Managers Index (PMI), coal consumption by power-generating firms, and crude steel and cement output. 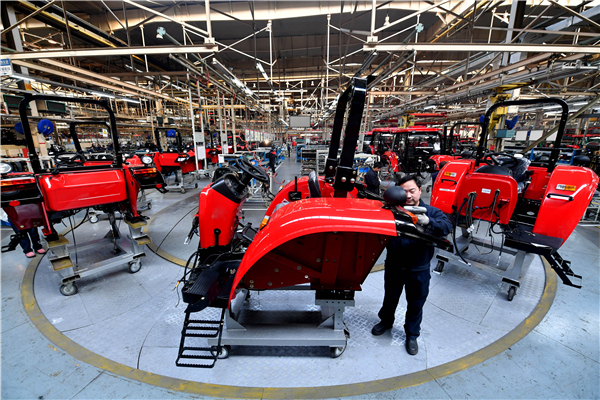 China’s manufacturing PMI, which indicates vitality of manufacturing activities, was 51.6 in March, 0.2 higher than in February and above the contraction-expansion demarcation of 50. Analysts predicted the economy will continue to grow in a stable manner in the second quarter, despite some unfavorable factors. Due to its tightening measures in recent months, China’s real estate investment may continue to cool in the coming months, affecting consumption of related products, such as furniture, electric household appliances and building materials, Lian Ping, chief economist of Bank of Communications, said. “Uncertainties also come from the international markets,” he said.